Bud and Doyle are two slackers who would rather waste time than clean waste--and Earthday is no exception. When their ecologically-conscious girlfriends trick them into driving into the Arizona desert, they stumble on what appears to be the opening of an ultra-modern shopping mall and duck in. Too late, they discover that they've compromised an experimental environmentally-controlled scientific community called "Bio-Dome." Worse yet, they are sealed in for a solid year. The head of the project, Dr. Noah Faulkner, and his five highly-trained fellow Domers are appalled and outraged... so are Bud and Doyle when they discover that a life without pollutants means a life without MTV, cigarettes and fast food. 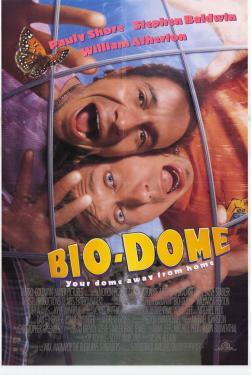 But then they notice that two of the Domers are "babes" and figure, when in the dome... Over the months, Bud and Doyle come to respect the project and its goals, and their misadventures even help to rescue the Bio-Dome from certain failure.